Tanti Saaz all the way!! As you all know I got the best Christmas gift of all times. I got to listen to all the 6 saaz designed by our guru’s play at one time. I have listen to kirtan done on tanti saaz numerous times but I have never been in a darbar were kirtan has been done on tanti saaz. Its a beautiful experience. The tanti saaz has the capability to bring out the emotions a particular raag is supposed to invoke. When the right feeling is evoked, the meaning of the shabad penetrates deep in your soul and you can feel the shabad. Personally I do not feel the Vaja has this capability. Listen to this shabad and you will know what I am talking about.. If you want to listen to more kirtan done by Raj Academy you can download it for the Gurmat Sangeet Project WebSite. Its been almost a week now and all this week I have been listening to kirtan being done on tanti saaz..now each time I listen to kirtan done on the tanti saaz I try to feel the emotion in the raag and believe me its a totally different experience all together. Do try to read the emotions involved with each particular raag and then listen to the kirtan and try too keep that in mind and sing the shabad..To read about the feelings/emotions associated with each Raag click here. Prof. Darshan Singh Ji is in town so will be attending his Vyakha Sessions. Also tomorrow for New Years we are having the Mahan Kirtan Darbar from 1830 hours to 0200 hours. I cant help but notice that we, the youth put in so much effort to decorate the Gurudawara Sahib for New Years, organize Rehin Sabhai but we do nothing on Gurpurabs. Please dont get me wrong I am not saying stop celebrating new years. Please celebrate. However, I hope in the coming years we can do more on OUR festivals. Happy New Year in advance to all my readers. If all goes well this will be my last post for the year. Watch this space for pictures of the Mahan Kirtan Darbar. some nice pictures here paaji! 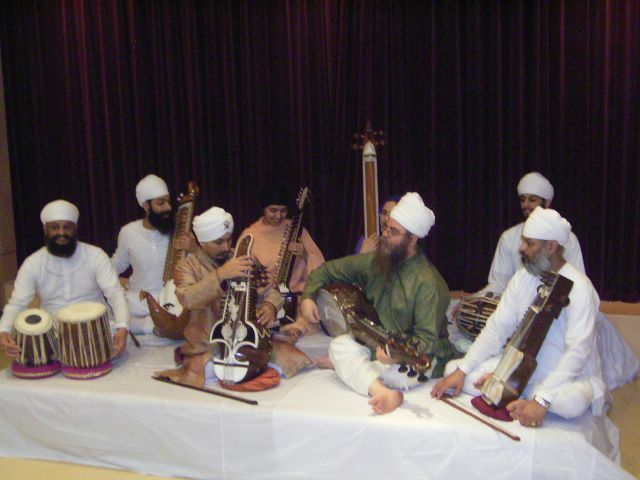 dint know you like gurmat sangeet!